Concrete layers embedded with rocks. 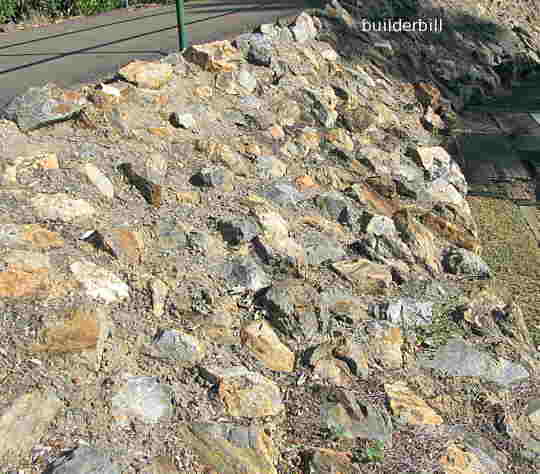 Used in embankments and culverts to break up the flow of storm-water and to stop erosion. 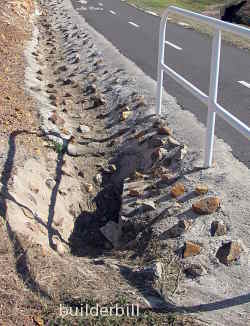 A rough use of stone and concrete in roadworks and landscaping to stop erosion. 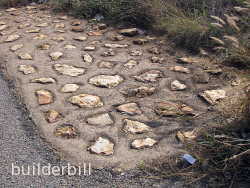 A layer of un-reinforced low strength concrete is laid and while it is still wet football sized rocks are place in it. The idea is to embed the rocks enough for them to be firmly held but to crete a rough surface to break up the flow of the water. Above is pitching on an embankment to a footpath. Below to the left is a storm water runoff channel or spoon drain, into a small culvert under a cycle path. In both of these case the rougher the stonework the better. At the bottom right the pitching is a lot smoother as it is at the side of a road.